Many people have hobbies and like collecting things, so naturally there are also people who collect things from WWII. In my childhood I started building and collecting the well known cardboard construction kits and afterward that, models of wooden ships. After my period in the Army, up to about the age of 30, I didn't do any modeling. Then by accident I came into contact with customers who were into military modeling. After a period of building hobbyshop kits, I started scratch building on the basis of the shop kits. 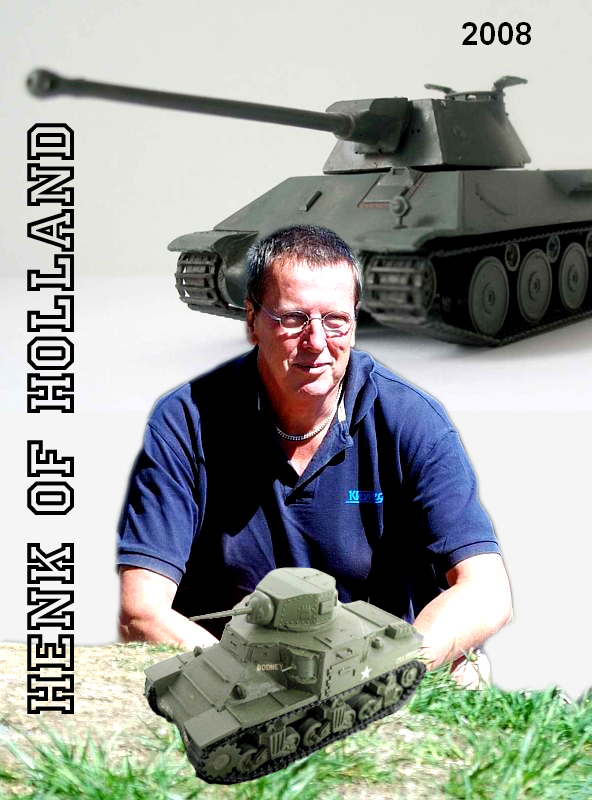 During an exposition of my models in "The fortress of Hook of Holland, The Netherlands", I became a member of the modeling club "TWENOT", which is a Dutch abbreviation of the "Second Dutch Organization from Tank hobbyist". I got so much information from this organization, that I began to build high quality models, and several foreign companies became interested in my models. I came into contact with some companies, especially in Scotland, the U.S.A., Germany and Australia. I have had business deals with some of these companies. The models that I build, on request from these clients, were eventually released by these companies. I also build on request for particular people. I have built several models for a compagny named "Ostmodels " in Australia, with a market in Australia, Japan and the U.S.A, and a compagny named "Milicast" in Scotland, with a market in Europe and the U.S.A. The other compagnies were Mr.Panzer in Italy, Fine Cast Models (FCM) and Fine Scale Factory (FSF) both in Germany. I built these models with the help of drawings, photographs, etc. for casting parts. After the master kit is finished I send it to the company. They make the parts on a casting strip and then make a mould of silicone rubber. This is almost the same material used by dentists to make dentures. The casting with resin or soft metal in the mould creates the parts for the kit. Casting with resin is very tricky, because air bubbles can destroy the parts. Casting with soft metal is less difficult but weight restrictions make it too heavy for sending by post. You can make a number of castings from a mould. When the mould is too soft it may last longer, but the parts tend to be distorted. When the mould is too stiff than you can destroy the mould while removing the parts. On average the mould will last for about 20 or 30 castings. Silicone rubber and the resin used is expensive. Casting, packing and sending by post requires a lot of time, so the product is also expensive. More expensive than the shop kits. Shop kits are made using injection metal moulds and are good for thousands of castings. However a good metal mould costs 10.000 to 100.000 Euro's or even more. This is far too expensive for a hobbyist. Thanks for your attention / Henk of Holland.